This is a two part series and begins with part 1. The idea of Lessons and Carols really has its genesis with Christmas services at the end of the 19th century. Then in the early 20th century Eric Milner-White started the very famous Christmas service at King's College, Cambridge. And this annual service, more than any other, is what many people think of when they hear "Lessons and Carols". But there's more to its origin than meets the eye. Milner-White had become convinced "that the Church of England needed more imaginative worship", but I think it helps to remember the context in which he was working. At the centuries-old choral foundation of King's there was no lack of opportunity for worship. There was Choral Matins (Morning Prayer), Holy Communion, and Choral Evensong. And Milner-White also sought "more imaginative worship" through new music. He used a friendly wager to entice Herbert Howells to write the Collegium Regale Morning Canticles (Te Deum & Jubilate). And if these pieces aren't "more imaginative" I don't know what qualifies. But I think Milner-White saw something else that a few others (like Bishop Benson in Truro) did. The specific possibilities for liturgy suggested by the genre of music specific to the Advent-Christmas season. Here the music (carols) must have suggested its own liturgy. Rather than music being the "hand-maid" of the liturgy, a dubious phrase one often hears in regard to Church Music, Milner-White saw it as the other way around. Here was a cleric who was perceptive enough to realize that the established liturgical forms didn't allow for this music speak well or speak fully. At Matins or Evensong maybe you could do a carol or two, but carols are so short. You would have to do a number of them for them to really add up to something substantial. And in this case they would needed their own service. So Milner-White designed it. Not just two or three lessons, but more. No need for a psalm or canticles. No need for much of anything, really, except hymns, lessons, and carols. After inaugurating the Christmas Lessons and Carols service in 1918, Milner-White added an Advent Carol Service to King's liturgical life in 1934. Most Advent Carol Services take place in the evening and are therefore often substitutes for Choral Evensong. But the traditional canticles at Evensong (the Magnificat and Nunc dimittis) also have value in a Carol Service. One place to connect Evensong to Lessons and Carols is St. John's College, Cambridge, just a short boatride away from King's. St. John's began a tradition of an Advent Carol Service a couple decades after King's. The first Advent Carol Service was held on 2 December 1956. From the outset it had been decided to make this an 'admission by ticket only' event, and close on 1100 people attended what has now become an annual service. Since 1981 it has been broadcast, and is now relayed to many radio stations in the United States and Canada, as well as to other countries throughout the world. Guest, George. (1998) A Guest at Cambridge. Brewster, Mass. : Paraclete Press. p. 28. St. John's has served as an inspiration for St. Peter's, St. Louis in the past: the installation of a Mander organ at St. Peter's was inspired by the very successful Mander installation in that college chapel. And the Advent Carol Service from St. John's is not exactly a well-kept secret. It has been broadcast annually on the BBC since the 1980s. It's order has been printed in at least one past issue of The Episcopal Musicians Handbook. And another order of service from St. John's has been used at St. Peter's in the past. Here's an explanatory note from the former Dean of St. John's. "Introduction to the Advent Carol Service"
In the past quarter of the century, the colleges of Cambridge, and St. John's in particular, have developed special forms of service to mark the beginning of Advent; and these are widely called Advent Carol Services. Since Christmas falls in University vacation, there was a natural desire to anticipate Christmas by singing carols. At the same time, the instinct for good liturgy meant that we wanted to keep the specifically Advent themes of solemn preparation for the coming of Christ. In St. John's College, since 1956, these two elements have been combined to effect a successful liturgical experiment. This success derives, perhaps, from the tension between the two elements. Thus the form of the service is essentially linked to Advent. The Collects for the four Sundays in Advent suggest the main themes which are explored and illuminated in the scriptural lessons. The plainsong settings of the Advent Prose and "O" Antiphons, dating from the eighth century, express most poignantly in words from the prophesies of Isaiah man's deep yearning for salvation and redemption. The carols, in a joyful and earthy way, look forward to the mode of that redemption in the circumstances of the incarnation and the person of Jesus. Finally, the service reaches its climax in the words of the Christmas collect and in the singing of "Adeste Fideles."" The service is rich. You can view this year's service booklet for yourself. You can also listen to this year's service for the next 26 days after this article's publication. There's so much to love about this liturgy beyond the lessons and the music: the sentences; the versicles and responses at the head of each section (my favorite being "Prepare ye the way of the Lord / Make his paths straight. "); the collects. But one thing that I chose not to incorporate at St. Peter's for our service is the seven O Antiphons. Don't get me wrong; I love the O Antiphons. But their inclusion in this already rich service seems like an "everything but the kitchen sink approach". (Besides, St. Peter's has already offered a simple service focusing on the O Antiphons this year). The collects in the service provide a nice bridge to the historic collects found in the 1662 Book of Common Prayer. The collect for section two, the Word of God, is the collect for the Second Sunday in Advent (note that in the 1662 book the preposition is different than it is in the 1979 book). This prayer finds a place in the 1979 book as the collect for Proper 28 (the Sunday closest to November 16). Blessed Lord, who hast caused all holy Scriptures to be written for our learning: Grant that we may in such wise hear them, read, mark, learn, and inwardly digest them, that, by patience and comfort of thy holy Word, we may embrace and ever hold fast the blessed hope of everlasting life, which thou hast given us in our Savior Jesus Christ; who liveth and reigneth with thee and the Holy Spirit, one God, for ever and ever. Amen. The collect for section three, which does not appear in the 1979 book at all, is specific to John the Baptist. O Lord Jesu Christ, who at thy first coming didst send thy messenger to prepare thy way before thee: Grant that the ministers and stewards of thy mysteries may likewise so prepare and make ready thy way, by turning the hearts of the disobedient to the wisdom of the just, that at thy second coming to judge the world we may be found an acceptable people in thy sight, who livest and reignest with the Father and the Holy Spirit, ever one God, world without end. Amen. The collect for section four, at least in the present service, is not the collect for the Fourth Sunday in Advent, but can be traced to an Anglican Altar Services (1941) collect for the Feast of the Blessed Virgin Mary (August 15). Using a Marian collect here is congruent with the focus on Mary in the Gospel lessons for the Fourth Sunday of Advent in the Revised Common Lectionary. Almighty and everlasting God, who didst stoop to raise our fallen race by the child-bearing of blessed Mary: Grant that we, who have seen thy glory manifested in our manhood [St. John's substitutes "flesh"], and thy love perfected in our weakness, may daily be renewed in thine image, and conformed to the likeness of thy Son; who liveth and reigneth with thee and the Holy Ghost, ever one God, world without end. Amen. Finally, a note about the music itself. It should be noted while the informal name of this service is the "Advent Carol Service", the title page actually reads "A Service for Advent with Carols". I believe that this name is deliberately chosen to not limit the music solely to "carols" but to allow for all kinds of liturgical music (including hymns and canticles, which were part of the original design). As with the Christmas Lessons and Carols service at King's College, the Advent service at St. John's includes a heavy dose of new music, especially new music written for carol texts. But with the doors thrown open to all types of music (assuming at least two carols, to stay true to the plural in the service's title) we see the full flowering of Lessons and Carols as one of the great liturgies of the Anglican church. What started as music begetting it's own liturgy has now come full circle. This elegant liturgy is now inspiring new commissions and compositions. I find Lessons and Carols so fascinating because the realm of creative possibilities within its fixed structure is so immense. This is Church Music at it's finest: not as a hand-maid of the liturgy, but a full partner with it. Of course there are always other Advent Carol Services to consider, too! "Have you done this service before?" someone asked me at coffee hour on Sunday. We were talking about our upcoming Service of Lessons and Carols for Advent on Sunday, December 11, 2016 at 5:30 p.m..
Of course I had, hadn't I? But really the answer is no, I haven't. Not exactly. So I explained that while I had done similar services, I have never actually done the specific liturgy that we will use this Advent. But I couldn't give her the longer answer. So, here it is. I'm sort of obsessed with Carol Services (can you tell?). Why? Well, if it came right down to it I'd have to say that the innovation of Lessons and Carols is the apotheosis of the "low church" tradition. Let's define the terms. Here "Lesson" means a short reading of scripture, though "Short" is relative. A "Carol" can be many things, but historically these are strophic songs (often with a refrain) of a popular or "dance" character on subjects related to Christmas (or Easter, or some other sesason). We will consider the development of carols in relation to these services in part 2. There's something about the juxtaposition of the familiar and the new that speaks to our spiritual selves. This is especially true if the tradition truly takes hold and you get to hear the same lessons year after year the music offers new commentary, new insight alongside the biblical text. The carols and hymns themselves serve a homiletical function and reinforce each other. Without Sermon or Eucharist, the congregation is allowed to hear in word and music the message of the season and respond with vigorous hymn singing. I suppose my very first memory of a Carol Service for Advent would have been an order from the Episcopal Church's official Book of Occasional Services (BOS). There are plenty of lessons to choose from. But if you follow that order literally you have to include the lesson from Gen. 3 about Adam and Eve. And isn't that same lesson typically used at a Christmas Lessons and Carols service? Kind of an odd choice, but okay. And the Bidding Prayer in that book is ... well ... it's really lousy. It's just the Christmas Bidding Prayer slightly warmed over. It really misses the mark and doesn't speak to Advent at all. Don't get me wrong, I think I was involved in some lovely services that used the BOS scheme, but I wanted to look elsewhere. Anyone who has spent any time planning carols for Christmas has stumbled upon the Advent Lessons and Carols information in the back of Carols for Choirs 2 (CfC2) from Oxford University Press. I've always assumed that the order in CfC2 to be somehow connected to the service in use at King's College, Cambridge. After all, one of the editors of CfC2 was David Willcocks. But information about any of the "Procession for Advent" services, past or present, in that place have not been forthcoming online. (Add to the list of things to research when I take a sabbatical to Cambridge in 2022). The Bidding Prayer of the CfC2 Advent Carol Service, at least, is substantially better than the one found in BOS. It actually speaks to Advent itself, and is not just a warmed-over Christmas prayer. Beloved in Christ, as we await the great festival of Christmas let us prepare ourselves so that we may be shown its true meaning. Let us hear, in lessons from Holy Scripture, how the prophets of Israel foretold that God would visit and redeem his waiting people. Let us rejoice, in our carols and hymns, that the good purpose of God is being mightily fulfilled. Let us celebrate the promise that our Lord and Savior, Jesus Christ, will bring all people and all things into the glory of God's eternal kingdom. The blind receive their sight, and the lame walk, the lepers are cleansed, and the deaf hear, the dead are raised up, and the poor have the Gospel preached to them. And at this point I thought that I had found a Bidding Prayer and lessons that worked well for the season of Advent. And then, stupidly, I got in the car at the end of Thanksgiving weekend (the trip from Richmond took about four hours) and attended the Procession with Advent Lessons and Carols at St. Paul's, K Street in Washington, D.C. This service was transformative. It was exquisite. And it didn't come from BOS or CfC2. It spoke authentically to the season and left nothing out. Furthermore, it incorporated the idea of a Procession (note that the service at King's to this day is called a "Procession for Advent"). Video: The national Episcopal Church very wisely decided to record a video of this service last year which provides a very good documentation of that service, but, like any recording of liturgy, it is truly no substitute for being present and taking part. If you ever have the opportunity to attend, I strongly encourage you to do so! So I had to go back to the drawing board. I went through every single resource I could find and lay everything out on the table at once. Every possible lesson was examined and considered. Different structures were weighed. Ultimately I thought that the notion of a Procession was too compelling to discard. If the Lessons and Carols is a "low church" idea (reading, music, repeat) adding the teleology of a liturgical Procession into the proceedings seemed to incorporate some "high church" gravitas without otherwise compromising what is compelling about Lessons and Carols. It was about this same time that I attended the American Sarum conference in Bronxville, N.Y. which helped clarify my thinking about liturgical processions. Naturally, Salisbury Cathedral figured prominently into the conversation, and that place has their own wonderful Advent Carol Service. For hundreds of years liturgical processions have marked boundaries – the physical boundaries of the parish, the church – and in so doing invoke the very boundaries between heaven and earth. Such a procession is particularly resonant in the Advent season when we look expectantly toward the celebration of God’s crossing of this very boundary through the Incarnation of Jesus Christ. For the pattern of the service I tried to read the Greek Revival architecture of St. Paul's, Richmond and determine what route in the building would best tell the Advent story. 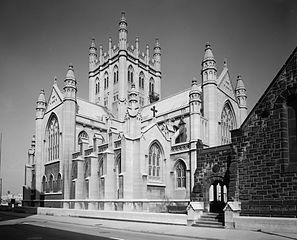 The service at the English Gothic St. Paul's, K Street with it's divided choir stalls simply wouldn't work in the spacious, 800-seat church in Richmond, with it's Gallery Organ. I liked this service, and I think it was the right fit for St. Paul's at the right time. St. Paul's seemed to be a place on the cusp. It had been steadily moving away from it's "low church" heritage and more in line with the liturgical practice put forth in the 1979 Book of Common Prayer. Eucharistic vestments had appeared a decade or so before, Morning Prayer had greatly lessened in prominence, and I understand at the present time incense and a sung Sursum Corda (both rarities in the Diocese of Virginia!) are regular features. For the next few years the St. Paul's Choir and I were able to explore this order a bit and make it our own. Now I find myself in a different parish, and I feel the need to "crack this nut" once again. For reasons of space and churchmanship I do not think that another "Procession" is the right answer. So it was back to the drawing board – again. Continued in "Carol Service - exploring the Advent, part 2"
One word keeps cropping up: fear. This is an anxious time. It has been this way for a while, and it's not getting any better. To hear the Rev. Fleming Rutledge tell it, "We are all battling fear in a way that has not been true in America since World War II, and perhaps not even then, since that war was fought far away." Jesus told his disciples to “be not afraid” about as much as he said anything to them. To be seduced by fear is not new to our time, though perhaps our culture is uniquely equipped to create a deafening cacophony of fear-inducing noise. Might this “armor of light” help us to reject captivity to fear, which is surely one of the great works of darkness? I think so. "Cast away the works of darkness". Seven Whole Days 13 December 2014. "Do not be afraid" is one of the great refrains of scripture. And it is the first thing the Angel Gabriel says to Mary. Almost a year ago the Rev. Fleming Rutledge offered a two-part rumination on Advent (one that mentioned Donald Trump, of all people). "We will be saved through judgment; but we will not be saved without judgment." Those two great Anglican poets of the 20th century, T. S. Eliot (in Murder in the Cathedral) and W. H. Auden (in For the Time Being: A Christmas Oratorio) evoked a sense of Advent as a time of foreboding. The ultimate hope-beyond-hope is always there, beyond and through the foreboding, but when the essence of the season is diluted by cheery, upbeat, inferior forms of hope, the Advent power of the ultimate promise of God scarcely registers. Advent is meant to be portentous, which is a very different thing from our standard assumptions that everything is going to work out for the best. Who can believe that any more, anyway? In this season of the year 2015, a front-page feature article in the New York Times 12/4/15 tells us of our fears, fears that we never expected to have. (The article is by N. R. Kleinfeld, who wrote the chief feature article for September 12, 2001--first sentence: "It kept getting worse." First sentences in the recent article: "The killings are happening too often. Bunched too close together. At places you would never imagine.") There is a profound theological message here. Advent is the very opposite of the "countdown to Christmas," because it tells us of our status in the world as it is. When Jesus spoke of "the ruler of this world" he meant Sin and Death, also called Satan. We have no right to expect anything from God. Advent requires of us an unblinking assessment of the real situation we find ourselves in. And later on she writes: "We will be saved through judgment; but we will not be saved without judgment." To that I would only add two stanzas of this great Advent hymn. and with words of love draw near. Hymn 59. "Hark! a thrilling voice is sounding." st. 3, 4. There were some silly arguments over the season of Advent on everyone's favorite social networking site over the past few days. Whether the Great Litany is appropriate (it is), what colors are appropriate for the Advent Wreath (purple? blue? a pink candle too? ), which direction one should light the Advent Wreath (clockwise? ), what kinds of gummi candies to include in one's traditional Advent Jello Salad, etc. Let's not argue about Advent – what it is, what it isn't – let's cherish it. Let's relish those dual actions, the casting away of "the works of darkness", the putting upon ourselves "the armor of light". Let's let Diana Butler Bass have her blue candles. Advent should not be a mini-Lent; it is not a time to examine sins, engage in self-denial, and confession. It is not about penance. Rather, Advent is of a different spiritual hue: It is a time of waiting, of expectation, of hope in the darkness. The blue candles symbolize the color of the sky right before dawn, that time when the deepest dark is just infused with hints of light. But let us not be too quick to deny the penitential aspects of the Lent of St. Martin let's also celebrate with rich, dark purple candles if we want to. Let's think carefully about acknowledging our sins in this season, and at Christmas too. Where such a mighty guest may come. It is prideful of us to think, because we heard about John the Baptist for two Sundays in Advent, that we have adequately made ready that home within us. If all it took were two Sundays, wouldn’t everything be just hunky-dory? Only the most daft among us, looking within himself and around at his immediate community and the wider world, could imagine that a couple of Sundays of introspection are all that we need to be cured of our various delusions, our thoughtlessness, and our self-absorption. "Confession and Grace". Sed Angli. 1 January 2015. Whatever your perspective on the minutiae of Advent, let's remember to cherish the season. I think it's possible for me to love this time of the Church's year, to recommit myself to prayer and worship, and not feel like I need to convince everyone else to do it the way I prefer. There's something peculiar about the intensity of opinion that people hold for this season. Maybe it's the sticky-icky residue of our intensity of sentimental feeling around Christmas itself, and it's wrapped up with all that secular/sacred baggage. But I sort of suspect not. I suspect that it's a short (only four Sundays' worth) season overflowing with rich imagery, tradition, and meaning. There's so much to cram in to Advent! Twenty-four hymns in the Hymnal 1982. In many years Advent is only about 24 days long. That's about a hymn a day! And don't forget the O Antiphons, too! Consider, as I heard in a sermon recently, the two arcs of the liturgical year. The first follows the life of Christ, from Advent to Easter and Ascension. It goes "beyond" the life of Christ, as it must, with Pentecost, and Trinity Sunday. The second arc, which grows out of Trinity Sunday (or Pentecost, if you must, but remember that Trinity Sunday is one of the seven principal feast days of the Episcopal Church), is all about the life of the Church. And the meeting place between the two? Advent. Read forward, Advent foretells the birth of Christ that we celebrate at Christmas. But read backward, Advent heralds the second coming of Christ the King for which the Church awaits. This is the audacity of the Advent Sunday alarm clock for the Church! Wake up! Keep watch! Finally, the weekly letter from Anglicans Online seems to have put this much better than I have. Thankfully, the problem contains its own solution. The church communities arguing about the meaning and practice of Advent are trying in a feeble, feeble way to begin to declare the coming of the Lord to Standing Rock and Aleppo, Flint and Lampedusa. We're just not always very good at it. Advent in whatever colour and whatever register is our annual reorientation to the Crib: to the weak, the cold, the margin, the poor, the exile, the pregnant woman, the perplexed father, the traveling strangers possessed of uncommon wisdom, the angels singing in the dark and silent sky. Advent invites us to remember our own first weakness and reliance on the strength of parents, the welcome of our families when we were infants, the provision in our social circles for a stable arrival of a child. In the awareness of these things, it invites us to extend them in the name of the Christchild to others on his behalf. It is good for us to argue about what Advent means and how to keep it. It means our hearts are in the best place they can be, if we order them aright: attentive, caring, waiting, watching, thinking, hoping, open, gentle, strong. Whatever the colour we see each week in church, we pray our minds will be true to the invitations of the season and its successors. Take a walk at night. Walk so silently that the bottoms of your feet become ears. Many of my colleagues provided music at Thanksgiving Day services this morning. It is one of my favorite services of the whole year. The Thanksgiving Day Eucharists I've been involved with tend to be a bit smaller than a typical Sunday morning Eucharist. Definition of the word Eucharist Eucharist is Greek for "Thanksgiving," and is the preferred formal term in the Episcopal Church for Holy Communion. A few years ago I attended a Thanksgiving Day Eucharist at the Cathedral in Asheville, North Carolina, and the church was completely full! There are other places where going to church on Thanksgiving morning has become "the thing to do". And so this morning at St. Peter's, while we may not have had as many of the faithful in the pews as some other places, we were probably one of the very few churches (or the only?) that added to their number. We had two infant baptisms this morning. The association with Eucharist is an easy one to make. But the association with Baptism also seemed good to us who were gathered at St. Peter's. There's a hymn that seems to have only appeared in the last two Episcopal hymnals (and nowhere else) that is often sung on Thanksgiving: "We gather together to ask the Lord's blessing". It is our custom to sing a hymn immediately prior to the Baptism, and this was the hymn I chose for today. At the end of the first stanza we sing "he forgets not his own", which seems fitting. The second stanza of this hymn seemed to speak more directly to the Sacrament of Baptism than I had previously thought. thou, Lord, wast at our side: all glory be thine! How wonderful that God joins these children to the Church and so ordains and maintains his kingdom. And that from the very beginning they have won the fight. For this act we should be truly, unfeignedly thankful. "O Lord, make us free!" When I was assistant organist at the cathedral of the Episcopal Diocese of Indianapolis in the late aughts it was customary for the boys and girls of the choirs to begin the year with a retreat at Waycross Camp and Conference Center, just a short distance away from Bean Blossom. It wasn't uncommon for boys and girls (mostly the girls) to pick up a "Bean Blossom" souvenir t-shirt nearby (they were tie-dyed) and wear it to choir rehearsals throughout the year. It was a reminder of the joyful experience and deeper friendships formed at that annual time together at Waycross. For the choirs, "Bean Blossom" was just one more expression of togetherness. So it is painful for me to read of the recent vandalism to St. David's, Bean Blossom. And I can only imagine the heartbreak and fear that the people who make St. David's their spiritual home are experiencing. It is the stereotypically unfortunate vandalism we have come to expect since the election of Tuesday, November 8, 2016: the president-elect is great; white people are great; gay people are not. But it's not entirely surprising. Between the cathedral on picturesque Monument Circle in downtown Indianapolis and the bucolic Waycross Camp you pass through Martinsville, Indiana. Martinsville has a disturbing section on "prejudice" on their Wikipedia page, and to this day people in central Indiana remember it as being a particularly associated with white supremacists. It was an alleged Ku Klux Klan stronghold in the 1920s and labeled a "sundown town." Blacks were expected to clear out before dark. "Indiana Town: From Racist Past to Primary Present". NPR. 30 April 2008. Martinsville is surely filled with good people who condemn the vandalism at St. David's, but there must be one or two in the area who still pine for the "old days." And this is part of the unfortunate muck-raking that the president-elect seems to have wrought. Latent racist cultures and attitudes – that under-gird our society more than we care to admit – feel that their time has come (again). ...the kind of language used during the recent Presidential campaign has emboldened some people to become openly abusive and insulting. Our option as faithful people is to be sure we don’t respond in kind. The Episcopal Church will continue to welcome all people, to seek and serve Christ in the world around us, to strive for justice and peace among all people, and to respect the dignity of every human being – even those who deface our buildings. Our buildings can be marred by anger and hatred – we will not allow our hearts to be defiled. Let's all put on our Bean Blossom shirts today. Let's pray for the people who cowardly spray painted this church in the middle of the night. I believe part of the message of the church is that hate can lie buried and fester, but when love is buried it blossoms. Let's let love blossom in the face of all this hate. I'll never forget the first time I sang the hymn tune SAN ROCCO. It was at a Choral Evensong sung by the choir of Hereford Cathedral in October 2002 at Trinity Episcopal Cathedral in Cleveland, Ohio. I believe that this service was just one of the regular Wednesday Evensongs still offered regularly at Trinity, Cleveland, which, while a bit smaller, bears a striking resemblance to Hereford. I can't remember how full the building was, but I would wager it was a bit fuller than they typically get on a Wednesday night. On the other hand, it certainly wasn't full or even close to it, which was a real shame because this service was something. At least, it was to me. At the time I was a junior in college and just a few weeks earlier had begun working in an Episcopal church. I was excited about going to this Evensong but I didn't really know what to expect. Had I even ever been to an Evensong at that point in my life? Probably not. But I'd picked up a Prayer Book and, having done a bit of homework, I sort of knew what it was about. This was also the first time that I had heard an English cathedral choir in person. I remember being surprised that at least one boy seemed to have forgotten his white surplice back in England. He was easy to spot in the procession because he came down the aisle in only his blue cassock (the cathedral in Hereford is officially "Cathedral Church of St. Mary the Virgin and St. Ethelbert the King"; churches named after the Blessed Virgin Mary typically wear blue, I would learn later). How embarrassing for him, I thought. Then I saw another chorister dressed the same way. And then another. And I remember thinking that this must mean something too, but what? I was on the edge of my seat because everything was new that night. There was the newness of the Prayer Book, this American document that prescribed liturgy in the Episcopal Church, but was a direct descendent of a book of the same name from England. It was this English book that the Hereford Choir would know, so a close observation of the service might tell me more about the worship tradition in which I was now engaged. I vaguely remember checking the lectionary in the back of the book to see if they had chosen the right lessons. I still do this today when I get distracted (though now only with the daily lectionary). It was all so much to take in, and it was all so grand. And the singing was fabulous. The Psalm was beautifully chanted. The liturgy was seamlessly conducted and very dignified. But the thing I remember the most clearly was the final hymn. It was SAN ROCCO, and it was glorious. Trinity, Cleveland is a bit unusual in that there is not a big organ up front the way you would expect to be. Rather, there is a great big Flentrop in the back. It's more the kind of organ that Bach would have known and less the kind of organ you expect to find as the main instrument in a large Episcopal church. Flentrop was big presence in northeastern Ohio in the second half of the last century. A small Flentrop was installed in Christ Church, Oberlin in 1964. A three-manual Flentrop was installed in Warner Concert Hall in the Oberlin College Conservatory of Music just a short ways away in 1974. Trinity, Cleveland put in a similar instrument in 1977. (They also have a 14-stop Choir Organ that was installed in 1976). If you enter from the liturgical West doors at Trinity, Cleveland, you walk under the lofted organ to enter the nave. In plain view is a tall metal spiral staircase that one must ascend to reach the organ. And so it was at the end of this Evensong that whosever it was who had climbed the stairs and was accompanying the service cracked open the Hymnal 1982 and launched in with the introduction to SAN ROCCO. And – here I rely on my more than a dozen-year-old memory of this event, but I believe it to be credible – the introduction to this hymn was in D-flat. The reason I feel somewhat confident in this assessment is for two reasons: 1) I was working on my pitch identification with great intensity back then. I would keep track of key areas and such whenever I attended a concert or recital (and would often notate them in my program to keep myself honest); and 2) it sounded a ever so slightly funky in the temperament on that Flentrop, which leads me to believe that it wasn't C Major. If all this is correct it means that the experience I remember so vividly involved hymn 253: "Give us the wings of faith to rise", the words of Isaac Watts, and a splendid modern hymn tune by Derek Williams. Earlier on this blog: A few years after I attended this service the words of this same hymn were included in fallenness - flatness as. I was swept up in the drama of the music, and they paired so well with the words we were singing (the more I think of it, I'm sure it had to be Hymn 253. The tune pairs well with Brian Wren's "When Christ was lifted", but it's just not the same!). And part and parcel of the drama that I was experiencing was this viscerally propulsive two-bar interlude that comes out of one stanza and leads seamlessly back into the next. Embellishing the space around the break in the stanzas is a modern hymn tune trope that began with the pedal thumpery of Stanford's ENGELBERG. It's a quest to eliminate the amorphous pause between stanzas (the organist's perpetual necessity and dilemma) and offer a musical unification of the poetry that is (mostly) whole. As an aside, it's the kind of linkage we so sorely need between the last two stanzas of Frank Mason North's long-lived Social Gospel hymn "Where cross the crowded ways of life" by Frank Mason North. It's perhaps the most final sounding semi-colon in all of hymnody, and without one of these "revolving door" tunes, how can it be otherwise? Maybe someone will give us a Long Meter equivalent of SAN ROCCO. Maybe someone already has! But, in the mean time, we still have SAN ROCCO, the "richly textured, thoroughly modern tune". Its sweeping ascents and its and audacious range. It defies gravity a bit, this tune. And maybe that's what that interlude is about. It's so bold, the hymn tune, that it needs something else a bit more weighty to bind it to earth before it goes soaring through the air once again like an exuberant albatross. It's touching base, perhaps. I'm talking here of the two-bar "Optional Interlude Between Stanzas" in the Hymnal 1982. You can hear it employed on the very find recording The English Hymn, Vol. 1 - Christ Triumphant recorded by the Wells Cathedral Choir under Malcolm Archer. I have to say, I've learned that the Hymnal 1982 can slightly sanitize some of the more pioneering elements in modern hymnody, and I wonder if the word "optional" might be an American editorial insertion. At any rate, I'd be curious to see the original publication of the tune and figure out if the composer really considered it "optional" at all. Because for me personally, this interlude is part of the whole experience. And when I start this hymn up this morning for All Saints' Sunday I'll be transported back, once again to that Evensong – back to a chilly October evening in Cleveland. It will take me back to that soaring gothic nave and the stained glass. It will take me back to the sounds of that Flentrop organ and the airy lightness of the Hereford Choir. It will take me back to the sense that I had stepped into a tradition that was much older than I was -- a tradition that I was eager to absorb, study, and be a part of. But not a stodgy immovable tradition that never innovates. It's the kind of living tradition that would attempt the breadth of Anglican music but with a Flentrop organ, not an Aeolian Skinner. It's the kind of tradition that would allow for an Optional Interlude Between Stanzas. About a year and a half after my first visit to Trinity, Cleveland I returned to that same cathedral on a May morning to be confirmed into the Episcopal church. And though it wasn't included in the festive Eucharistic liturgy again that day, the words and the inspiration I drew from that hymn at Evensong were with me. It had kindled in me a zeal. This hymn had started me on a path and led me back again, to seek Confirmation and a committed life in the Episcopal expression of the Christian faith. In a very real way, SAN ROCCO changed my life. they reached the promised rest.